My opinion of this product is very similar to the one for the Cheddar flavour. When I opened the package, I noticed again how small the pasta is. IT did grow after cooked, though. However, like the cheddar, the Alfredo sauce tasted just like the regular cheesed Alfredo sauce. There was still a very slight chemical taste, but not nearly as much as the cheddar. 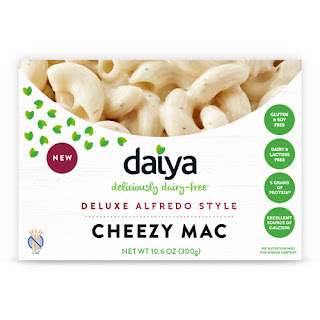 Similar to the cheddar, the Alfredo sauce also tasted a bit sandy. I don't know if that's the sugar of if it's something else that doesn't dissolve properly. Talking about sugar, I was again weary of eating this because it contains refined sugar. I looked at the box and it says "Sugars: 0g" so I understand why I bought it. But it is listed in the ingredients list, so I know there is a little bit. Still on sugar, I also felt a small "more more more" addictive craving for this pasta. Not nearly as much as the cheddar, but still a little bit. I wouldn't buy this again because of the sugar, but in terms of taste it is ok.